I was over there this weekend for the business school "red carpet weekend," (I'm a JD/MBA person) and picked up some WF Law gear at the bookstore. They had maybe 4-5 styles of t-shirt, and a few sweatshirts, 2 or 3 types of car window stickers, and I think a hat. I got a really nice t-shirt that has a faux-vintage look to it (reads WFU school of law). 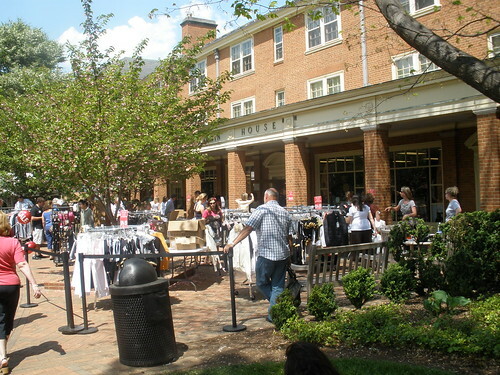 I believe there are 4 different places on campus to buy apparel, and of the two I went to it seemed like they each carry a different selection of stuff. May have to wander around a bit to find exactly what you're looking for. Alternatively, if you're not going to be in Winston, you can always go to zazzle.com and make your own custom wake law stuff. You can throw whatever onto a nice American Apparel shirt for like $20 with shipping if you google a discount code. I've made stuff on there before and they do a really nice job. Many schools seem to be rolling out 2009 employment stats. Anyone know when WF will be publishing theirs? Any adcom strolling through this thread as a guest want to create an account and share? In all seriousness, I thought it was interesting information. However: wake was # 150 in career preperation. #150 career prep, eh? is it really that bad or just a product of last year's bad numbers? the career prep/ job concerns are the biggest things holding me back from being 100% committed to Wake, otherwise I love, love, love the school. Where in CA? Currently, I reside in Santa Barbara yet I will move next week to orange county. Nicholasnickynic wrote: why no w-s pics? Eh, by the time we got out there it was getting dark so the pictures wouldn't have been great, plus we were going out to the bar and I didn't want to feel like a tourist the ENTIRE time I was there. I think it was awesome of you to post the pics you did, and thanks for those. living in CA and not having a lot of money, I wasn't able to visit before I had to send my deposit, so this is only the second set of images that I have seen of what the campus is really like . My status checker went from Administrative Review to completely blank today. Good news or final sign that they simply threw away my application? Ben2010 wrote: My status checker went from Administrative Review to completely blank today. Good news or final sign that they simply threw away my application? No clue. Thursday and Friday seem to be the announcement days though. Trae, glad you enjoyed your visit. I noticed the same as far as diversity goes. I'll add a little more color to the pool. Maybe we could possibly go in as roomies with another incoming. Friday morning I headed over to the law school for a class visit and tour. 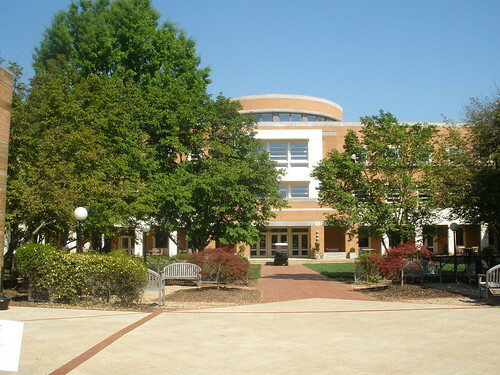 The law building is right at the entrance of campus, and there is a large parking lot right next to the building. Already I can tell the campus is beautiful - the law building is surrounded by trees and everything is well kept and pristine. Across from the law building are the tennis courts with more awesome landscaping, which is right up my alley since I play a lot of tennis. The building itself is better than I expected, but that isn't saying a WHOLE lot since I had pretty low expectations, based on what I have heard. Most of the classes are on the first floor, and the second floor houses things like admissions, career services, etc. For the most part, the building's condition seemed fine but I can definitely see how some would say it is cramped. Since I was there on Friday it wasn't too crowded, but I can see how some would say there isn't enough space. However, everyone has their own carol in the library, which most people apparently treat as there main desk - they leave books and stuff out there and it seems like no one worries about things being stolen (although I didn't see any laptops left behind). The library was a little underwhelming, but honestly I don't think that is a big deal. I mean, you have access to West and Lexis Nexis where you will do the majority, if not all of your research, and there is certainly room in the library to study if you want. The lounge area was nice, and I guess while it is warmer out it isn't too crowded because people will be outside more, but during the colder months I was told it can get packed. The classrooms aren't really too bad, and those certainly aren't cramped as most classes only have 40 students in them or so, at least your first year. The courtrooms are pretty small, but they have 2 or 3 I think so, maybe that makes up for it. I didn't get a chance to check out the finals of the moot court competition on Friday, but I heard it was going to be well attended - I would have liked to see how many people could really fit in there. My interactions with everyone during my visit, however, were wonderful. I headed up to admissions where Jenny Hutcherson, the admissions assistant, greeted me and hooked up me up with a folder with some information and a WFU School of Law blanket, which was pretty cool. While we were up there talking and waiting for another prospective student I learned something kind of interesting - Jenny knows who I am on here! Had a pretty good laugh about it, although I can't say I'm surprised (most of my specific information is on here, so it can't be too hard to match it up). Anyway, Jenny is awesome, and I am definitely not just saying that because she may be reading this, haha. She was extremely helpful answering any questions I had about Wake, Winston-Salem, or anything else, really. I also met Melanie Nutt as she was on her way out of admissions after the tour, and she is great. Between her and Jenny, I definitely felt "at home", so to speak, at Wake Forest. The student who lead the tour was really candid about answering any questions the other student and I had, which I appreciated. The class I sat in on was Evidence, which is a 2L class for the most part, and so the professor taught using more of a lecture format. The material was interesting and the professor allowed plenty of times for questions and answered them thoroughly. The student I sat next too was really friendly and took a minute to ask me some questions and answer any I had, both before and after the class. So after the tour and I picked up my friend from the hotel we were staying at and we drove back to check out the rest of the campus. I have to say, it really is a beautiful campus and I can see why they keep it gated. Everything is well kept and there are trees, bushes, and flowers everywhere. Being from Illinois and the southwest Chicago suburbs, I am just not used to this much green, so maybe this isn't big news for people from the area, but I was pretty blown away. 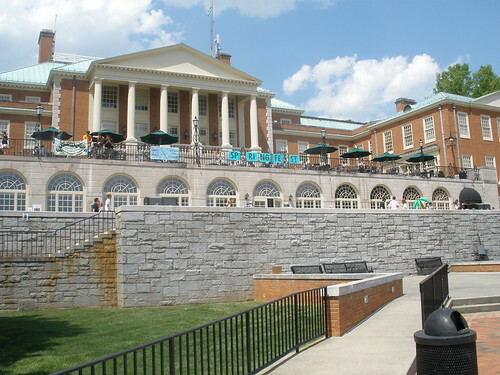 We took a peak inside Reynolda Hall and it was very nice inside as well - big food court and lots of seating to eat. Honestly, the whole campus is picture perfect. However, in this is my first gripe about WFU. Now, I'll preface by saying that it appeared to be some sort of admitted students day for undergraduates, or some sort of weekend where parents came down, so maybe this is a little bit out of the norm (but from what I have heard, it is not). Anyway, the undergraduate campus has very much so a rich white kid school type of feel to it. Probably about 70% of the students/parents I ran into were wearing Ralph Lauren or Lacoste. It was not very diverse, at all. While I didn't get exactly the same feeling at the law school, the class I sat in on didn't have one black student out of about 60 kids. Now, I'm as white as they come, but I come from a very large public school where you can pick 7 people at random and you will probably get 3 different races, so this is just what I am used to, but also what I value. Just my two cents, and I will add that I never heard any sort of racist comments or undertones or anything like that - at all. I'm just saying it was very homogeneous, from what I could see. As this post is becoming a little epic, I'll try to wrap it up. I checked out Crowne Oaks Apartments and they were awesome. Very spacious and all the appliances look to be high quality. We had lunch at Twin City Diner and it was good, I had that Gus burger with chili and slaw on it which someone recommended. Later Friday night, we headed into downtown Winston-Salem and had a few beers and burgers at Finnegan's Wake. Cool atmosphere, although at this point I became pretty confused as to where the undergraduates go to drink/hang out, as there were definitely few, if any, undergraduates there. This was on a Friday night, too. Upon further thought, however, I'm not sure if this is a bad thing... The rest of Winston-Salem is pretty nice, especially out by Mario's Pizza where it has more of a suburban feel to it, which is what I'm used to. On Saturday we checked out Charlotte. We stuck to Tryon Street, but it was really nice. Great restaurants and I was able to catch the Bulls/Cavs game at Fox & Hound. We also went to South Park, which is right outside Charlotte, I guess. Enormous upscale mall and from what I can tell an extremely nice, expensive area. The mall had a Louis Vitton, Lacoste, and Maggiano's, to put it in perspective. So yeah, fun trip and I'm definitely glad I made it. Here a few pics, but you can see them all here... http://www.flickr.com/photos/49427191@N02/. 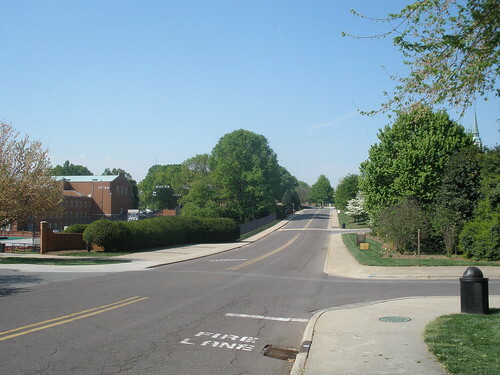 I only took pictures of the campus and Charlotte, so you should be able to tell which are which. Second that. I didn't see a big selection of Wake Law gear either. Kind of a letdown of the student store stop. When I went there, they had 1 cap, an ugly shirt, and a really ugly oversized 80s lady sweatshirt. =/ Not impressed. So does anyone have any idea when they'll be going to the waitlists? It looks like it was this time last year. Anyone else still waiting for a decision?? dang this thread died with the deposit deadline..... RIP Wake Forest 2010 thread. its been real. in my uneducated opinion, i imagine they might go to the WL a little later because I believe many more people than usual double/triple dipped with seat deposits. once those people start getting accepted off their WLs, they will start to withdraw, which will create a domino effect. again, totally my uneducated opinion. moandersen wrote: dang this thread died with the deposit deadline..... RIP Wake Forest 2010 thread. its been real. Get the defibrillator and bring it back to life! If anyone else has visited lately, let us know what you saw/thought. I love hearing others' opinions about the school. raoul79 wrote: Anyone else still waiting for a decision?? Me. I called earlier this week and I was told that I'd receive my decision by Friday, maybe sooner. FWIW, I went CR 3/2. maybe we need to move to the c/o 2013 thread? those pictures above are great, too bad W-S was covered in snow and slush on my visit. downtown was a ghost town. I'll join in to keep this thread alive! I love seeing the pictures of Wake in the Spring...definitely much better than the snowstorm they had when I was there on 2/5. I can't wait to be there in person. I've already got my apartment set up at the Crowne Park. I decided I didn't want to have to go back later to find an apartment (although the House Hunt sounds fun), so I checked out apartments while I was there. I'll be paying $770 for a 1-bedroom. Not cheap, but a heck of a lot cheaper than my former apartment in the DC area (for a slightly smaller apartment). Haha. That would be fine too. Just gotta have somewhere to talk about the school. I don't really care what it's about. It's just so sad to look on here and see nobody talking about Wake. Anyone heard from Wake regarding scholarship increases yet? They told me they'd get back to me in a week...about 3-4 weeks ago. tarheel87 wrote: Anyone heard from Wake regarding scholarship increases yet? They told me they'd get back to me in a week...about 3-4 weeks ago. Got the waitlist e-mail today. Won't be staying on the WL, goodluck to everyone riding it out. Just got the e-mail with the New Students website (http://newstudents.law.wfu.edu/). That'll give us something to talk about.